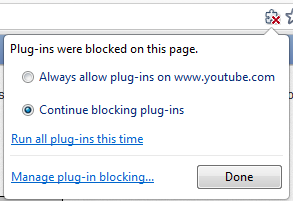 Google Chrome - Block Flash (& all plug-ins) without an Extension - Figure IT out! 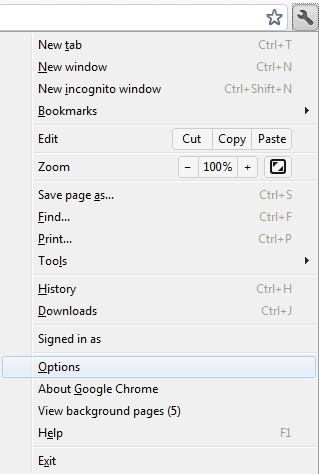 I’ve been using Google Chrome instead of Firefox for quite a while. I moved mostly for the simpler functionality and aesthetics. When I first jumped ship there were not a lot of extensions available for Google Chrome, but that quickly became a non-issue as many extension developers ported their stuff over. Getting to the point, today I was leaning over a co-workers shoulder and saw his flash blocker icon in on his toolbar and it reminded me that I used to use the extension in Firefox, but never re-checked for it after my initial set-up. As I was trying to determine which of the two top-rated Flash Block extensions I wanted to use, I read a review (dated: May 5, 2011) stating that Google Chrome will block flash natively. So I set it up, tested it out, and love its simple yet effective functionality. Here are the details. 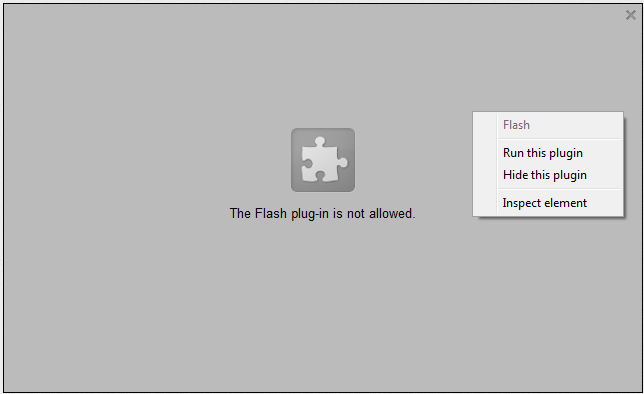 Note: These instructions disable ALL plugins, not just Flash. This was a perk for me. Luckily, they’re all easily managed … just check out the Usage section below. Note: These instructions are subject to change. If you have issues following them, check out Google Answers or try Googling for a solution. Click the wrench icon to the right of your address bar. Click Under the Hood, to edit that section. Scroll down to the Plug-ins section. Your settings should auto-save. Don’t worry about customizing permissions for specific websites; I’ll explain why below. I hope this helps! There’s no sense installing extensions to do what the browser can already handle quite well on its own. What’s more, I don’t have to install multiple extensions to disable multiple plug-ins, since this process disables all plug-ins, not just Flash. Simpler can definitely be better! For a complete list of all your plug-ins, browse over to chrome://plugins.